living in the moment – Naming a blog is harder than naming a kid. 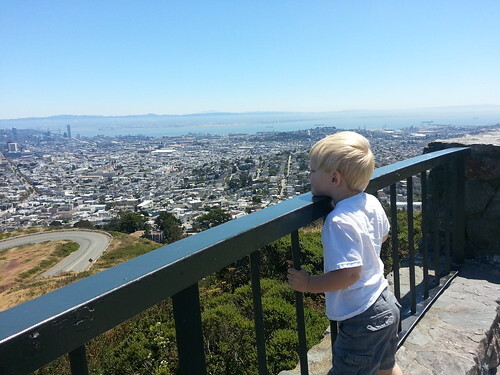 Twin Peaks, San Francisco, a photo by marymactavish on Flickr. The dog, as is his way, couldn’t figure out how to get back in the dog door at 2 am (which he can do just fine, if he doesn’t stop to think about it) and started barking to ask me to let him in. I think that’s what woke Owen, and he wanted help getting back to sleep. He tried, he really did, resting, and moving, and sighing, and I could tell he wasn’t trying to distract himself but really wanted to go back to sleep. I was terribly sore from my RA, underslept, wanting to sleep badly, and frustrated at the dog. I was thinking far too much about this, and Owen accidentally elbowed me in the head while shifting around (he likes us to lie beside him while he falls back to sleep, sometimes), and then he burped this tiny little burp. He giggled softly. “What funny noise is this?” he asked. And the grump was broken. Suddenly, there we were, happy to be together. I whispered to him about an upcoming trip we’re planning together, and what we would do, and what fun we would have, and though I didn’t hurt less or need sleep less, that little burp and his delight in it, right there in the moment, shifted my entire mood.